Brain–computer interfaces (BCI) are devices which measure brain activity and translate it into messages or commands, thereby opening up many possibilities for investigation and application. This book provides keys for understanding and designing these multi-disciplinary interfaces, which require many fields of expertise such as neuroscience, statistics, informatics and psychology. 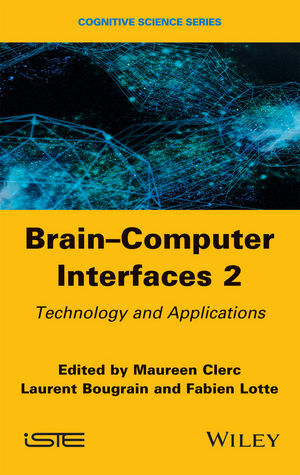 This second volume, Technology and Applications, is focused on the field of BCI from the perspective of its end users, such as those with disabilities to practitioners. Covering clinical applications and the field of video games, the book then goes on to explore user needs which drive the design and development of BCI. The software used for their design, primarily OpenViBE, is explained step by step, before a discussion on the use of BCI from ethical, philosophical and social perspectives. Laurent Bougrain is Associate Professor at the University of Lorraine, France. Fabien Lotte is Junior Researcher at Inria Bordeaux, France. aureen Clerc is Senior Researcher at Inria Sophia Antipolis, France.